My dad likes to tell this story on MLK day, which was told to him twenty-odd years ago by a Quaker colleague from Philadelphia. I've done my best to relate it to Brooklyn in a roundabout way, but I'm mostly just posting it because I think it's fabulous, even if it's a couple of days late. Sometime in the early 1980s, a dwindling Quaker congregation in the Philadelphia area found itself in rough financial waters, and came together to discuss the various ways they might avoid insolvency. Among the congregation's holdings was a small, free lending library, housed on the meetinghouse grounds and open to anyone who wished to use it. Many of these Quakers, while proud of the library's legacy as a free community resource, believed it received insufficient use to merit preservation, and suggested liquidating the collection and putting the space to some other, perhaps revenue-generating, use. The library's defenders argued that it remained a valuable collection for congregants and an important site for community interaction, and that despite the current state of affairs, it had once been a thriving little site of exchange and might one day be so again. This last point was disputed by some, who claimed that many of the library's books had barely, if ever, been used. As debates often do, this one became focused on a single hinge, namely, whether or not the books had received sufficient use. The congregation decamped to the library to seek the answer, and the pro-library contingent was dismayed. Book after book was pulled from the shelves, each opening to reveal few, if any, signatures on the sign-out card pasted to the inside back cover. History, social thought, literature, theology . . . it didn't matter. All but the most popular volumes were practically untouched. The library, it seemed, was doomed. A few stalwarts continued to pry books from the shelves, hoping to find a seam or lode of dog-eared, beloved tomes that would refute the mounting consensus that the library had outlived its usefulness. One persistent woman spied a copy of The Collected Works of Mohandas K. Gandhi and reached for it. Surely such a work would have appealed to generations of pacifist Quakers! She flipped to the back cover, and her heart sank. Only one name was printed on the sign-out card. Only one person in all the decades that this book had sat on the shelves had ever brought it home. She stared down at the card sadly, and then realized, with an exclamation of joy, that the name on the card read "Martin Luther King, Jr."
A few in the congregation were old enough to remember the young seminarian who had passed through in the 1950s, before Montgomery, before the Nobel Peace Prize, before he was simply "MLK" or "Dr. King." Many more recalled with pride that it was the American Friends Service Committee that had organized and funded Dr. King's trip to Gandhi's birthplace in India in 1959. All of them knew that Gandhi's thought, specifically his teachings on non-violent resistance, had made a profound impact on King. They kept the library. I love this story. It explodes the idea that some threshold of use is what makes a free lending library valuable. In theory, those in favor of scrapping the Quaker library could have argued that Dr. King had already encountered Gandhi when he stopped through the library, and certainly he would encounter him again. Having a book with his signature, they might have said, was a nice memento of his stop at the meetinghouse, but did not demand the preservation of an entire library that he and others had left mostly untouched. But they didn't argue this. 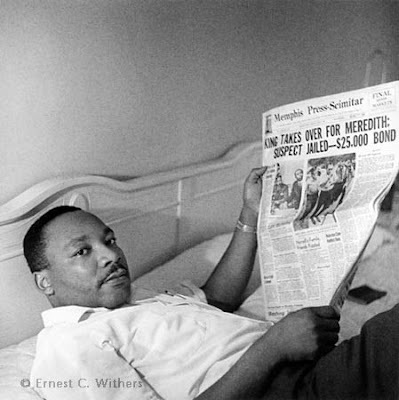 Perhaps the image of Dr. King refreshing his commitment to non-violence in their halls was powerful enough to sway them, or perhaps they recognized the more general point, that the power of knowledge is not quantifiable, and that ideas and minds, given the opportunity to interact, can produce the most unexpected and remarkable outcomes. This last is a lesson that cities and states would do well to remember as they cut the budgets of libraries across the nation, including right here in Brooklyn. That is a great story. I love the library...going on the weekend and loading up for the week at my local branch are some of the most satisfying memories of my childhood. It's why I volunteer at the main branch as an adult. Thanks for the reminder that benefits can not always be weighed, but may always be felt. Thank you for this story! Do you know the name of the Quaker Library? I don't, unfortunately - it comes to me third-hand. I'm hoping to actually speak with the woman who told it at some point soon and improve the story. What a great story. You might be interested in the impact another Quaker, Bayard Rustin who had a profound influence on Martin Luther King, Jr. and his work in the civil rights movement. Rustin is largely unknown as the civil rights hero he was because he was kicked out of the movement for being gay. It would be a life defining and singular contribution to the history of MLK and to the value of libraries in general if you could site sources for this story. Who found the book? What Library? When? Anyone still alive who remembers it?, etc. Sir, it would be worth whatever effort is required to find out these facts. It would be a stunning revelation and a world renowned discovery. I urge you to find out! Good thing you share the story about the library. Books should taken cared of for our future use. Isabel Marant not to mention their husband's comments Jér? uuttiopplll everybody Dreyfuss need developed form his or her's give good results, styling some cult dress lines (their) not to mention up-and-coming fashion accessories lines. Wow, really wonderful it is. I loved it.